OF THE NEW DTV STATIONS? If your system is located in one of the major metropolitan areas, such as New York, Los Angeles, Chicago, etc. with direct fiber access to the studios of the major networks and independent TV stations, no need to worry about the mandatory carriage of the new DTV broadcast stations. However, if you are one of the 6,500 CATV systems lacking the luxury of studio access by fiber, new antennas or antenna-arrays have to be installed to receive the over-the-air DTV broadcast. That may create a few problems. Lack of proper information. As a system manager or chief technician do you have the list of operational DTV stations in your service area? Where are they? What are the network or program affiliations? Directions an distances of the stations, as well as their output power. Do you need only UHF antennas or a combination of VHF and UHF antennas? If you are lucky only one UHF parabolic antenna is needed to pickup several or all the DTV stations. Otherwise your antenna tower may need a redesign and stress analysis. The Signal Direction Sheet below, as well as the tabulated data, are prime examples of a properly prepared DTV Study. Without the proper information you are in the dark. Channel 3, Chicago, Il. Channel 12, Waterbury, Ct.
Channel 5, Conroe, Il. Channel 8, New Brunswick, N.J.
All VHF DTV stations are exposed to adjacent channel interference, generated by the conventional analog channels. Do the tuners of the signal processors (DTV receivers) provide any adjacent channel protection? You know the answer. Are bandpass filters, traps, and I-boxes the answer? You may want to start to negotiate for the return of these items while issuing the purchase order. The interference-free reception of VHF DTV stations require the application of phased-arrays, forcing a deep radiation pattern null into the direction of the interference source. The phased-array is the proper tool, in reality the only device which ascertains full protection. 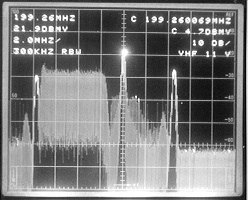 The photograph below, taken from the screen of the spectrum analyzer, shows a real DTV adjacent channel interference situation in Groton, Ct. The DTV station, Channel 10, New Haven and the analog station, Channel 11, New York are simultaneously on the air. The adjacent channel interference produced unacceptable picture quality. Conditions at the Knollcrest, Ct. site were found even more disturbing. The Digital Signal Direction Sheet below exhibits the exact directions and distances of the three (3) DTV stations operating on VHF channels. The Signal Direction Sheet below displays the analog VHF stations to be carried on the system. A serious reception conflict existed between the DTV and the analog VHF stations. Channel 5, a 178 kW output power Hartford DTV station created unacceptable co-channel interference on Channel 5, New York, operating a 18 kW transmitter. To further aggravate the situation a DTV co-channel station does not create a 10 or 20 kHz beat in the desired channel. The traditional co-channel beat elimination procedure did not work. Channel 12, Waterbury and Channel 10, New Haven created adjacent channel interference for the reception of Channel 9, Channel 11 and Channel 13, New York. The conclusion to be drawn from the aforementioned issues: DTV reception is not without pitfalls. Expert technical assistance is essential, avoiding unnecessary mistakes, saving time and money.